Nothing can ruin a contractor’s reputation more than damage to the customer’s property at the worksite. Damage to floors, walls, countertops and fixtures during installation or repair work can cost the contractor extra expenses in the form of clean up. But the hidden cost comes in the form of loss of future work, with that customer and others. For interior work, it is always preferable for the contractor to perform interior work while the building is in its “rough” state. The job is generally easier if done before carpets or tile is installed or before walls are painted or before cabinets and counters are set in place. 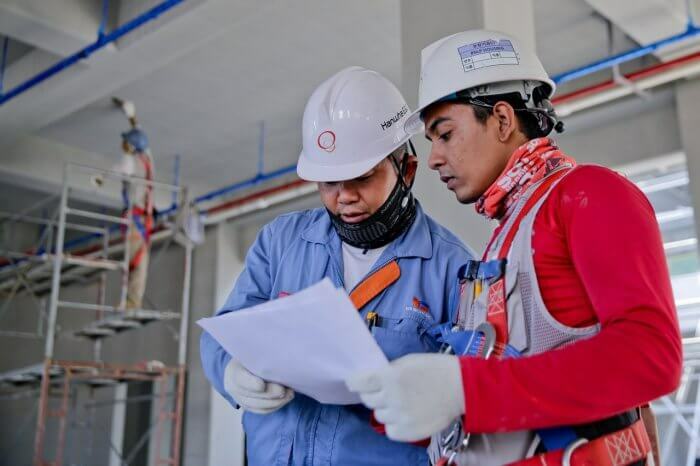 But due to inevitable scheduling conflicts among subcontractors or suppliers, there will be times when work must be performed after other work is completed. This is especially true in renovations, where a finished room is used as a traffic area. For these reasons, quality contractors will “prep’ the finished room to eliminate the chances of damage. Usually, preparation work consists of sealing off ductwork, electrical outlets and wooden baseboards and trim. Covering appliances and furniture, and protecting the flooring in the work area and traffic areas is also often a requirement. The type of protector used will depend on the type of work involved. For areas where welding, soldering, pipe sweating or other high-temperature tasks are performed, a heat resistant covering is necessary. Where water or liquid damage is to be possible, plastic and rubberized sheeting is used to prevent water travel. Where painting or drywall finishing is to be done, flooring paper is often used. Purchased in rolls or sheets, the paper can be used to cover an entire room or workspace. It can range in thicknesses from kraft paper to heavier rosin paper, to laminated construction paper. The heaviest covering often is laminated for strength and tear resistance. For areas where workers and materials traverse, a thick paper is often needed to avoid scratches, withstand spills and provide impact resistance from dropped items. This covering can be up to 45 mm thick and can be sealed for water resistance. Contractors will often look for a supplier that carries a wide variety of protective coverings. The type of product needed will often depend on the status of the worksite. A company such as Trimaco, for example, carries dozens of painting materials in their protective covering line of items. In addition, the company chosen will usually carry a variety of tapes, sealers, tools and other accessories to ensure the covering is laid correctly. Once the quality covering is properly installed, the contractor can perform the work in confidence and without the fear of having to return for posting job remedial repairs. Keeping all of these things in mind as a contractor is critical and can be the difference between a business’s success and failure. This is especially true in this industry, where word of mouth and repeat business is an integral part of success! NextAre You Wasting Cash on Your New Year’s Resolution?